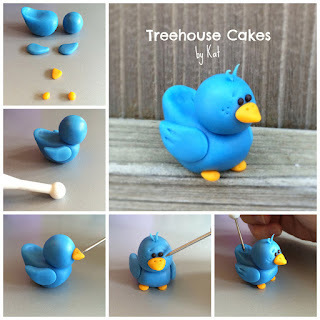 Finishing our week of creating cute and uncomplicated critters with a step-by-step bluebird photo tutorial from "Treehouse Cakes". Pre-tint some cold porcelain a 'bluebird' blue and a small amount of golden yellow. Start with a blue teardrop shape large enough for the body, a ball for the head and 2 teardrop shapes that will become wings. With golden-yellow clay, shape 3 balls into beak and feet. Use ball tool to indent large blue teardrop to shape a tail as shown. Attach head. Use a piece of toothpick between head and body for strength. Moisten joined area with a little water or dab of white glue. Attach wings to each side. If clay won't stick to itself by moistening with a little water, use a dab of glue. Attach beak and feet. Add 2 back beads (or balls of black clay) for eyes. Use needle tool to poke 2 nostrils in beak and to draw 'feather' lines in tail and wings. Also draw 2 tiny eyebrows and poke a few dots in each cheek. Lastly, shape a few topknot feathers and glue to top of head or use needle tool to push topknot into head. Awww the blue bird is so adorable! !